At a meeting in Paris on Feb. 24 the foreign ministers of Ukraine, Russia, Germany, and France proposed extending the OSCE’s mandate in eastern Ukraine and strengthen its mission to monitor the implementation of the Minsk peace agreements. Russian observers view the results of the meeting in a positive light, underlining the agreement on the necessity of withdrawing heavy weaponry as a step forward. The foreign ministers of Ukraine, Russia, Germany, and France have proposed extending the mandate of the Organization for Security and Cooperation in Europe to monitor the implementation of the Minsk peace agreements in eastern Ukraine, including a fragile ceasefire that has seen repeated violations since it came into force. Concluding a meeting of the four ministers in Paris on Feb. 24, French Foreign Minister Laurent Fabius announced that the representatives "had called on OSCE observers to bolster their special mission and increase their mandate." The ministers also called on all sides to cooperate with the mission and guarantee observers access to the conflict zones. The current ceasefire was agreed upon on Feb. 12 following marathon negotiations between the Ukrainian, Russian, German, and French leaders in the Belarusian capital. The truce came into effect on Feb. 15 but fighting continued around the strategic railway town of Debaltsevo, where a large group of Ukrainian troops was encircled by rebel forces. The confrontation ended on Feb. 18 with the withdrawal of Ukrainian units from the Debaltsevo pocket, after which the rebels established full control over the area. According to Mikhail Alexandrov, a leading expert from the MGIMO university’s Center of Military-Political Studies, although the agenda in Paris was primarily concerned with technical issues, an important objective was nevertheless reached: The participants of the meeting declared it necessary to begin withdrawing heavy weaponry, regardless of continued military activity in some sectors. "The Ukrainian side constantly implied that its positions were being shelled by the rebels, which is why it was not hurrying to withdraw its heavy weaponry," said Alexandrov. "Now it has been decided to withdraw the heavy weaponry even though there are still some sporadic skirmishes. The Ukrainian side should have no reasons to impede the implementation of this point of the Minsk Agreements." On the morning of Feb. 24, Anatoly Stelmach, representative of the Ukrainian forces fighting in the country's east, announced that since the rebels were continuing to fire, there was no talk of withdrawing heavy weaponry. Interfax-Ukraine cites Stelmach as saying that in order for this to happen, it is first necessary to reach "a complete ceasefire, at least for a day." Later it was said that Ukrainian forces would begin withdrawing their weapons only after two days of a genuine ceasefire. 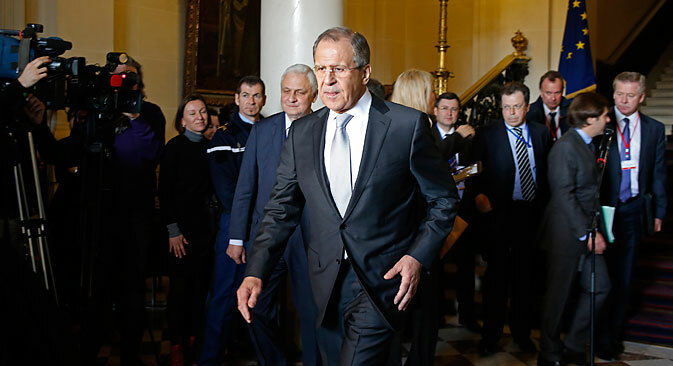 Russian Foreign Minister Sergei Lavrov announced after the meeting that his colleagues, "first of all from Germany and France," had backed his call to urgently withdraw heavy weaponry, without waiting for a full ceasefire." Representatives of the self-proclaimed Donetsk People's Republic announced that on Feb. 24 they already started withdrawing weaponry, under the observation of the Organization for Security and Cooperation in Europe (OSCE). Ukrainian forces are accusing the rebels of not withdrawing their weaponry but simply moving it to other locations and regrouping. However, according to Andrei Suzdaltsev, deputy dean of the World Economy and Policy Department at the Higher School of Economics in Moscow, the rebels are showing a real desire to withdraw their heavy weaponry from the conflict zone. Experts give importance not only to what was said during the meeting in Paris but also to what the participants did not mention: the possible deployment of EU peacekeepers in the conflict zone, as Ukraine had earlier proposed. On the eve of the meeting, Ukrainian Foreign Minister Pavel Klimkin announced that this issue would be discussed in Paris. In Alexandrov's view, the meeting proved that for now the sides are demonstrating their interest in implementing the Minsk Agreements, which make no mention of a peacekeeping contingent. According to Alexandrov, Kiev would like to use the idea of peacekeepers as a means of pressuring Moscow and the rebels. Another positive aspect of the meeting, according to observers, is that the situation in Debaltsevo did not influence the West to discontinue the Minsk process. However, Suzdaltsev says that Moscow was subjected to "heavy criticism" from Berlin and Paris over the confrontation in Debaltsevo, where fighting had continued until recently.